Aircel has announced the cheapest 3G Plan that offers 2GB of 3G data for the users at Rs. 178. Aircel, one of India's innovative telecom players, lights up the festive season for its customers with an unmatched offering in 3G data. 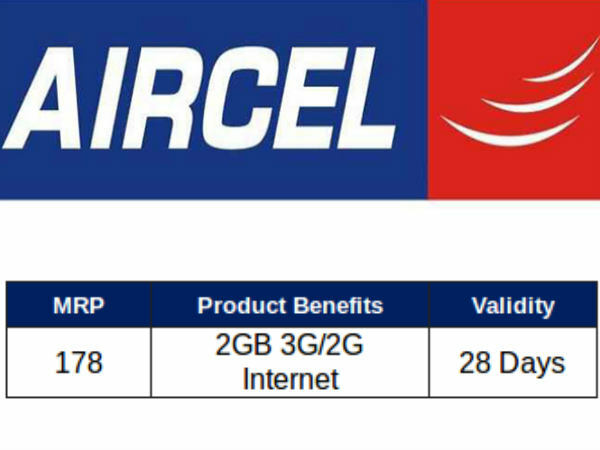 Aircel introduced the most affordable data pack offering of 2GB 3G Internet for Rs. 178 with a validity of 28 days. The exciting industry's first offering will enable customers to be online, share videos and consume entertainment more than ever before. The product is also available through e-recharge. Kanwarbir Singh, Circle Business Head - Karnataka, Aircel, said, "Aircel has spiced up the festivities with RC178, another splendid value proposition offering by Aircel in the Karnataka market, tailor-made for the data users. Aircel understands its customer needs of being online 24X7 and consuming limitless content and entertainment at an affordable cost. Hence we designed the product to offer unmatched proposition and further aiming at fuelling the mobile internet consumption." Aircel has witnessed a significant increase in the mobile data consumption in Karnataka. The company has redoubled its efforts in bringing innovative products and services which not only offer value but also lead to internet adoption.